When choosing a contractor, trust is essential. Knowing that your project will be completed on budget, on schedule, and on point is necessary for you to feel great about your investment in the outdoor space of your dreams. Our commitment to integrity and excellence does not end with Cornerstone’s founder; it’s a characteristic you will find in each employee of the company. From the first day of a project to its final moments of completion, communication and reliability are our top priorities. Our passion is transforming the construction process into a long lasting, feel-good relationship between each other and the land. Whether we’re revamping an existing landscape, working off of a set of architectural plans, or providing the design, planning and permitting for a project, the method by which we engage each job is unique and custom to the vision and requirements of our client. From our crew leaders and supervisors to our skilled laborers, we are a leaderful team who takes exceptional responsibility for our work. Each one of us shares an investment in the relationships we build with our clients, and we capably prove that in all our communications with homeowners, architects, and general contractors or sub-contractors. Cornerstone’s team goes out of our way to ensure a graceful execution of the entire process that matches or exceeds customer expectations. If we’ve done our job right, we have transformed the process of contracting from one of stress and mistrust to one that fosters lasting relationships that go beyond the project. 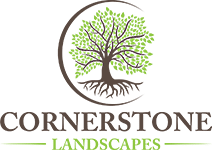 A note about subcontracting: We take pride in the fact that over 90% of our work is done in-house by Cornerstone employees. When the project demands a scope of work that exceeds our license, such as swimming pool construction or house-related electrical, plumbing/sewer work, we provide referrals to trusted contractors who are experts in their field. If we are doing construction management for your project, we will take responsibility for the subcontracting. We can be counted on before, during, and after completion to handle any issue that might arise. Our commitment to building a relationship of trust, reliability, and communication is why we have so many repeat clients! Our outdoor living spaces are designed to be enjoyed regularly. Occasionally we’ll hear from a client that a few months have passed since we completed their project and they still haven’t lit a fire in their outdoor fireplace or enjoyed a meal al fresco on their new patio. If that happens, don’t be surprised if we arrive with a bottle of wine and a plate of delicious snacks and help you christen your new space.